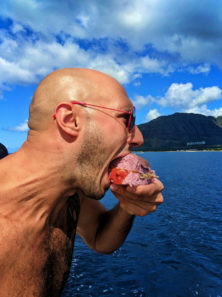 Watching people travel and eat on television has become such a staple in America. 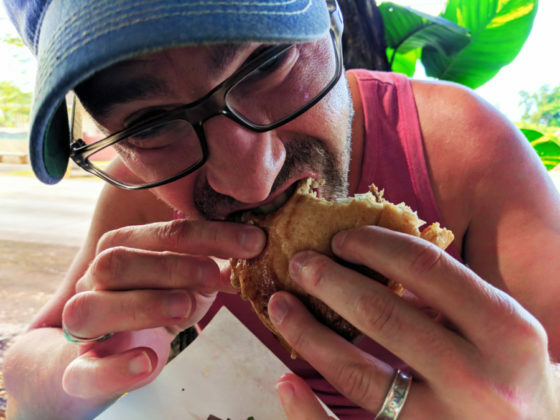 We tune in and find “the best unknown burger counter in Philly” and the “most decadent ice cream sandwich in Portland” or the “best places to eat on Oahu,” but what do you actually want to experience when it comes to food when you’re on the road? 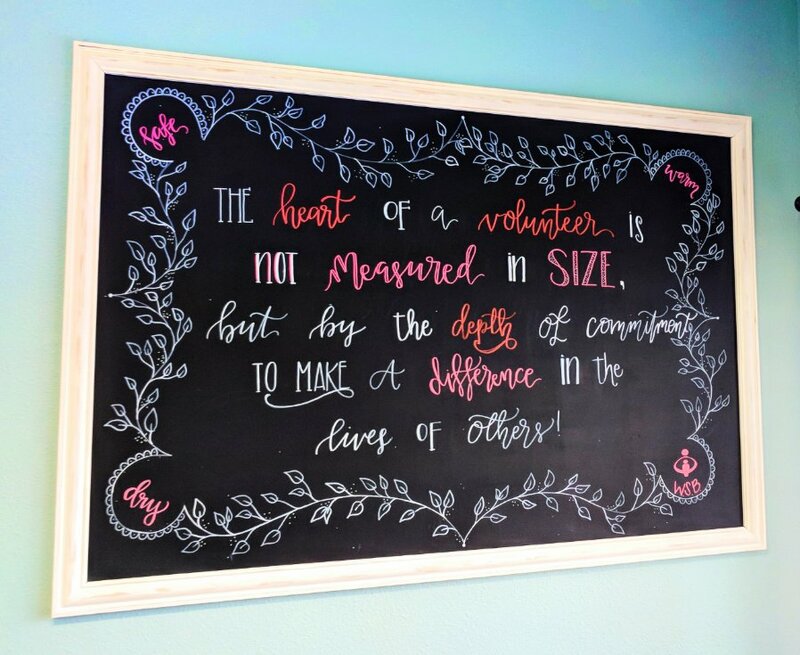 Part of exploring the scenic route is finding your own favorite stops and bites that you go home and tell your friends and family about. 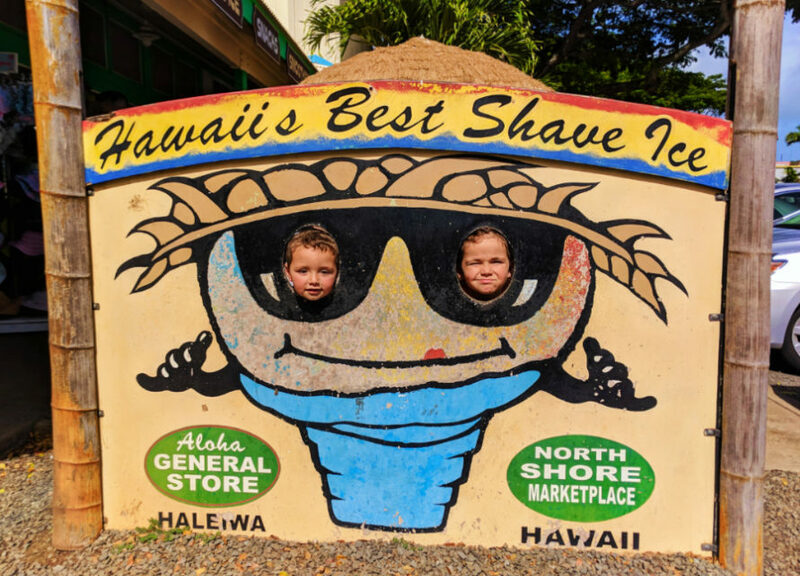 We just tackled the food of Oahu and it’s now time to set some expectations… and this is NOT the best places to eat on Oahu, but the best food experiences WE discovered and how to FIND the best places to eat on Oahu (or the other Hawaiian islands). 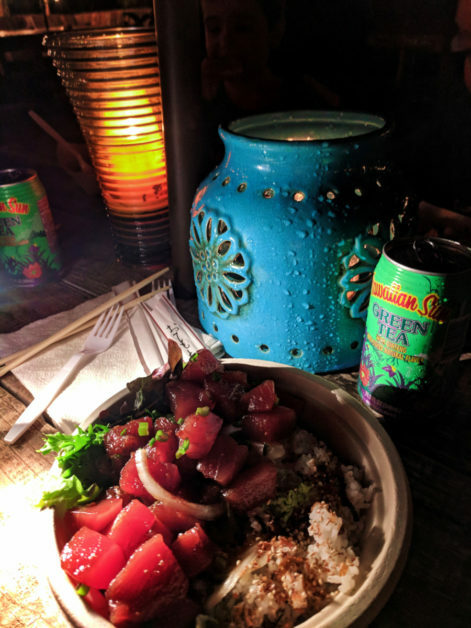 Haleiwa Joe’s – Kaneohe Bay and Haleiwa – catch of the day, black and blue ahi, Hawaiian atmosphere you would seek out. Tip: get there early cuz they don’t do reservations. 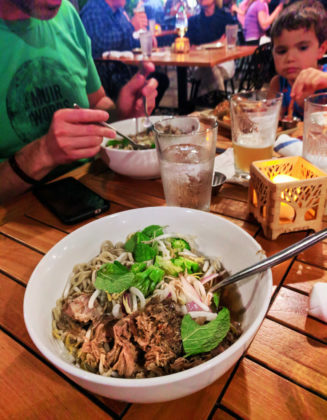 Monkeypod Kitchen – Ko Olina and 2 on Maui – perfect combo of Japanese Hawaiian fusion. Tip: Monkeypod is an easy alternative to resort dining if you’re staying at Aulani or another large property. Why were these spots great for us: because of their diverse menus, kid-friendly environments, and because we didn’t find them based on ads. 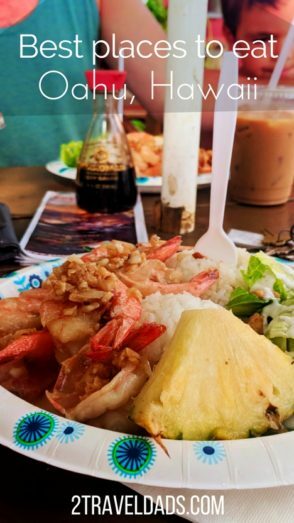 If we can find delicious food and get some specifically local dishes (think poke and loco moco), then we’re good to go. 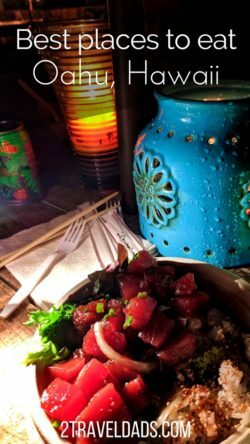 The best places to eat on Oahu are going to be different for everyone and might not even be discovered/featured in a travel blog yet. Tip: Oahu is heavily influenced by its Japanese population. There are many options when it comes to Japanese food, including sushi, katsu, and other cooking styles. And noodles. OMG: watch for saimin and then order it when you see it! If you ever take a trip to Portland, Oregon or Seattle, Washington you’ll no doubt see food trucks. Everywhere. We heard that there were some good ones on the North Shore of Oahu and it turns out that it’s true. 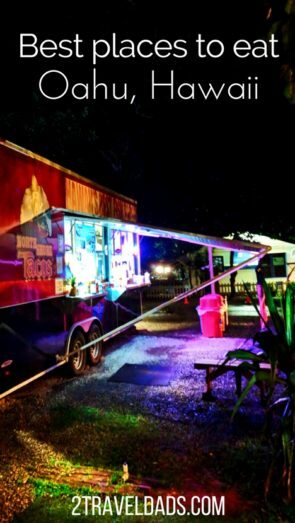 Actually, I’m pretty sure food trucks as a staple in West Coast cities are because of the food trucks on the North Shore. Just look at this totally incomplete map of food trucks on the North Shore. 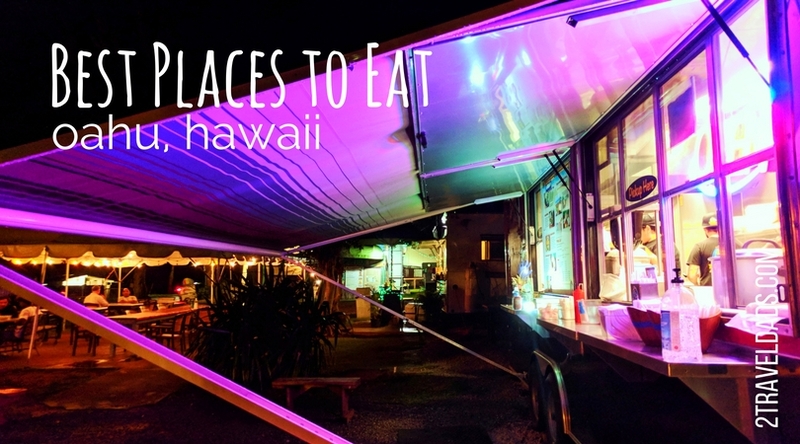 Some of the best places to eat on Oahu, for sure. 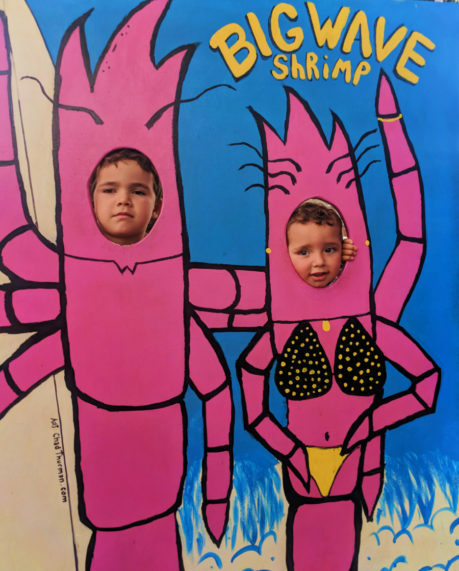 #1 – Our pick: Big Wave Shrimp. Good grub: peeled garlic butter shrimp. Always peeled, otherwise it’s just a mess with no benefit to peeling them yourself. The second hub was just after the bridge into Haleiwa. Again with the shrimp, shrimp and more shrimp. If you can get parking, send one of your travel companions to one truck and you grab a shrimp plate from another. #2 – Our pick: any that have their “pass” rating posted clearly and with a short line. Good grub: all the shrimps (peeled, of course. Always peeled). 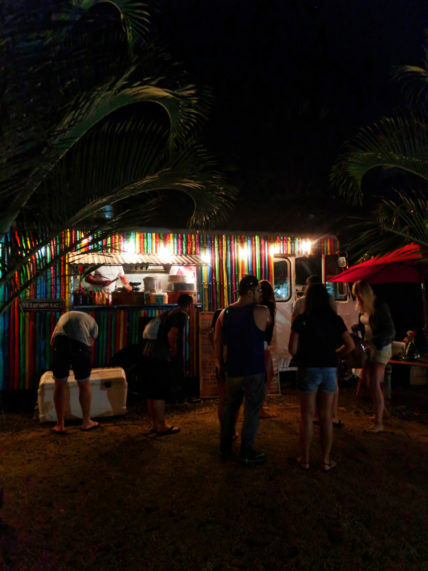 The third and favorite North Shore food truck hub we found was northeast of Haleiwa near Sunset Beach in Pupukea. 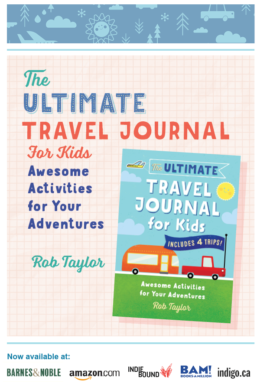 With ample parking, restroom facilities across the street (yay for travel with kids!) and a wide variety of cuisines, this spot takes the cake. 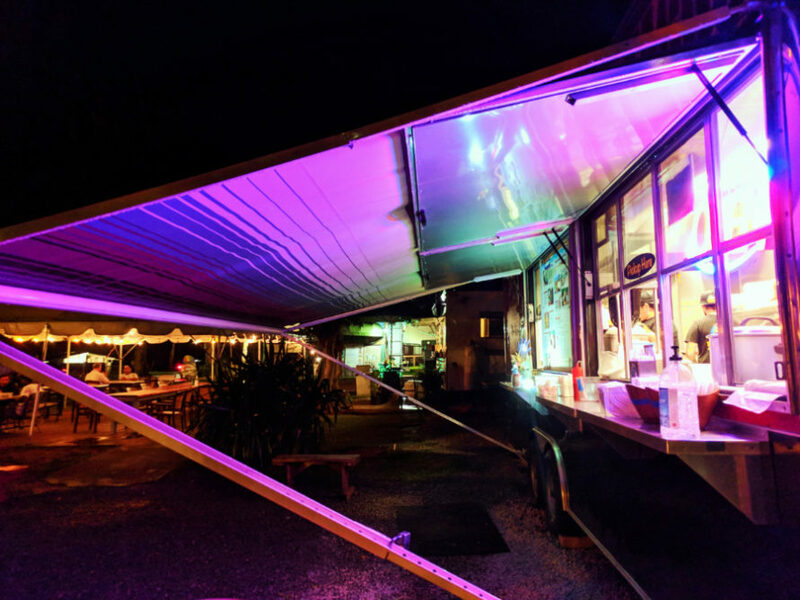 This food truck site is where we found some of the best poke around. #3 – Our pick: Aji Limo. 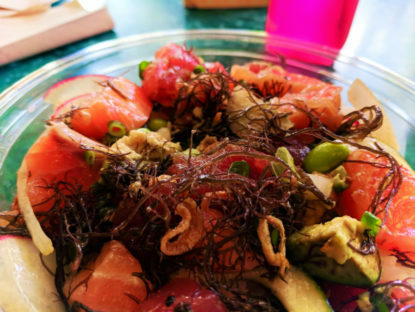 Good grub: Hawaiian Poke with sesame, seaweed and fresh ahi. It’s everything you dreamed poke could be. Good grub: Poke and eating all of that goodness. Hawaiian Poke specifically, but the Mexican inspired swordfish poke was also good. What is this “poke” stuff we keep mentioning? It’s basically seafood heaven in a bowl. 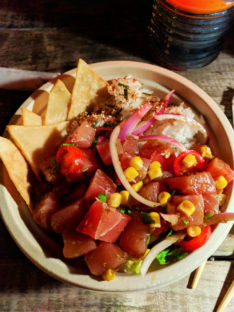 You can get poke several ways, but our favorite is served over rice with ahi tuna as the primary fish component. 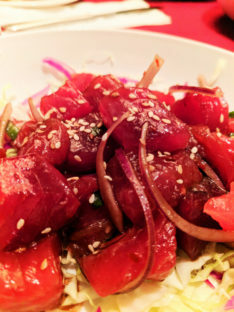 Salmon and swordfish poke is also popular, but no fish is as smooth and delicious as ahi. Want to know the secret to ordering a great bowl of poke? Keep it simple with just a few ingredients allowing the fish to speak for itself, ensure you get a little Hawaiian sea salt on it, and always take the seaweed recommendation from the chef/server. Seaweed isn’t everybody’s favorite food, but like lettuce or tomatoes, there are many types with different textures and flavor profiles. Add a little seaweed and go full Hawaiian. Tip: locals who are being honest will tell you that the best poke you can get in a pinch is from Foodland. Yep, that’s the local grocery store chain and they make sure to have fresh poke readily available for their hungry Hawaiian residents. Other Hawaiian staples you may have heard about include loco moco, a variety of S.P.A.M. preparations and, of course, mac salad. L+L Hawaiian BBQ, a local cafe-type chain, makes the best easy-to-get mac salad and other Hawaiian yums, like fried fish, kalua pork, and tasty snacks. And ahi (of course). Seriously, did it occur to us that some of the best food on Oahu was from a convenience-cafe? Not hardly. Also, and this may be completely unhelpful, but we were told that there are some pretty delicious and random markets that have awesome fish sandwiches and mac salads to go. If you’re heading to the beach, stop into any random deli and see what sort of grub you can find. 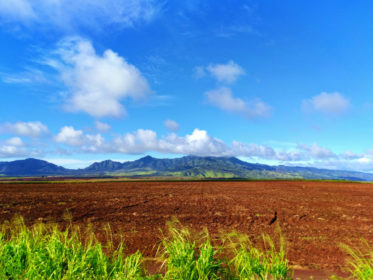 It may go without saying, but Hawaii is home to all kinds of farms raising some delicious crops. 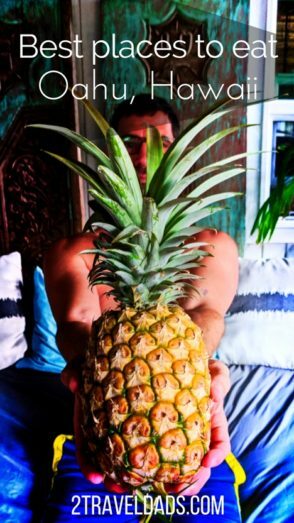 Although most of the crops grown on Oahu were brought to the islands over the last few centuries, the Hawaiian people grow some amazing produce. 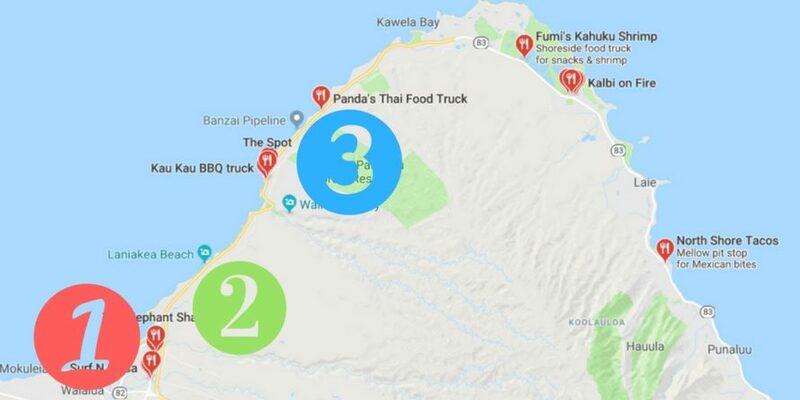 As you’re driving the Kamehameha Highway around the island, you’ll see many fruit stands, farm stands, and local markets. 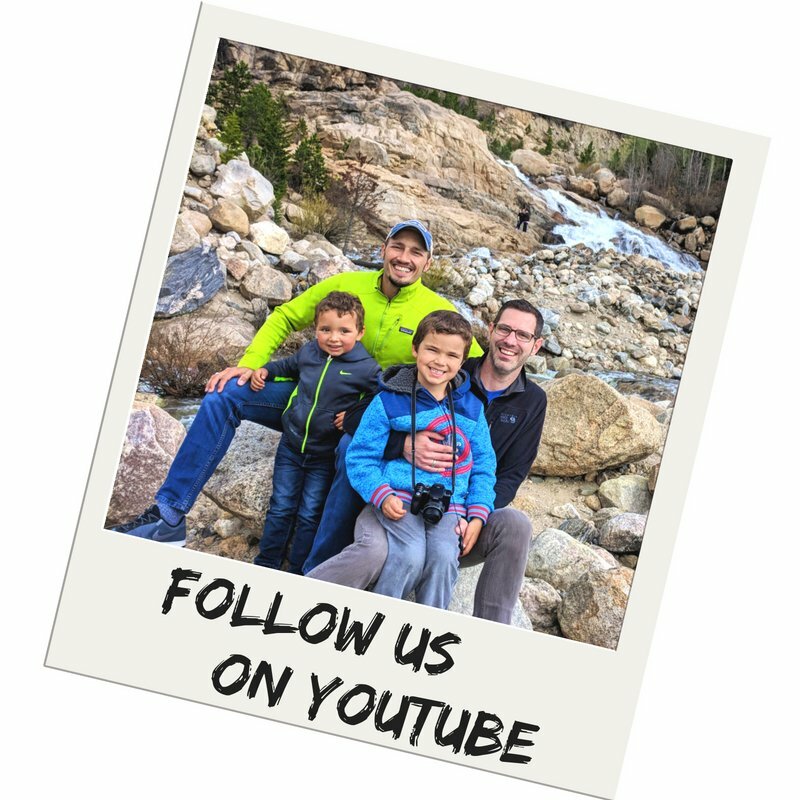 Our only tip is to buy local and enjoy. 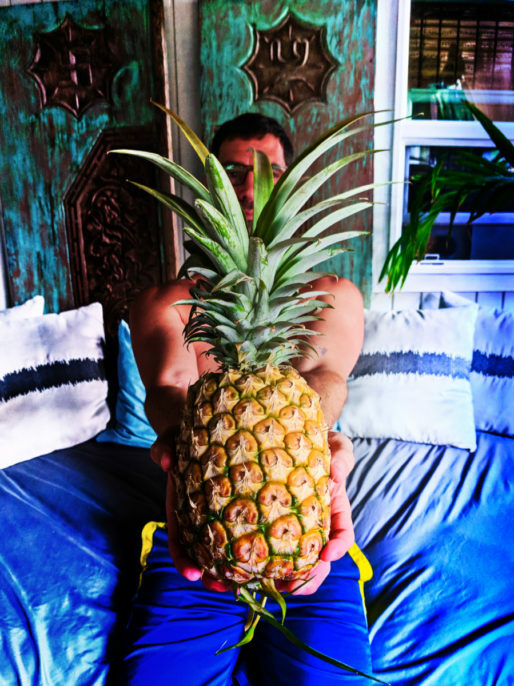 Never have we had such amazing pineapple as on Oahu. When we were in Wisconsin we heard about supper clubs. In central California we experienced the steakhouses. 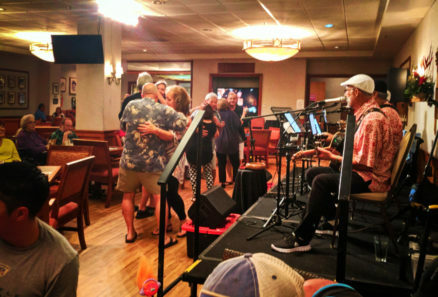 In Hawaii you need to look for the country clubs or “live music” spots. Honey’s in Kaneohe is part country club and part lounge. It’s like the Elks Club meets the dinning room at the golf course. 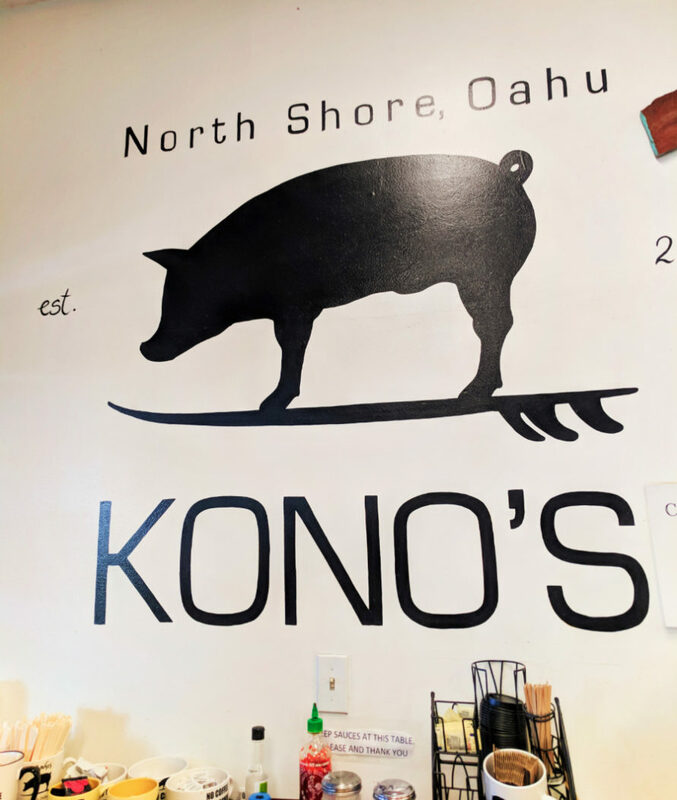 At Honey’s we found up-country cooking like pork chops and prime rib (#supperclub) but then we also had a full PuPu platter menu loaded with edamame, poke and kalua pork (#realHawaii). What made this local dining experience so great was actually the live Hawaiian band sporting their flower shirts and steel guitars. Sending this local dinner experience over the top: a long time auntie of the area and clearly a regular at Honey’s gave the dining room an impromptu hula performance to her favorite Hawaiian tune. We couldn’t have planned it better. 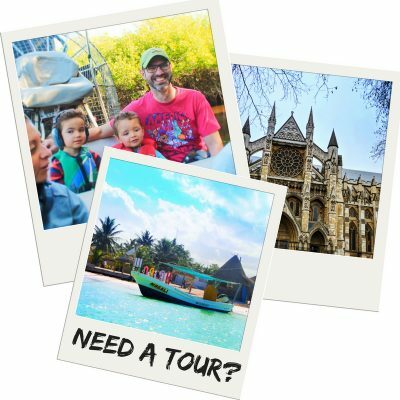 Tip: although it may sound strange, ask a local for a music recommendation or where their ohana might meet up with the grandparents. 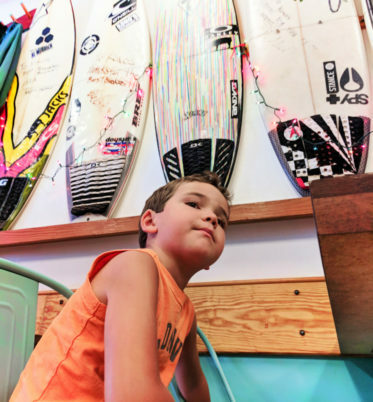 Chances are you’ll find a place with a humble reputation and endless aloha spirit to share. 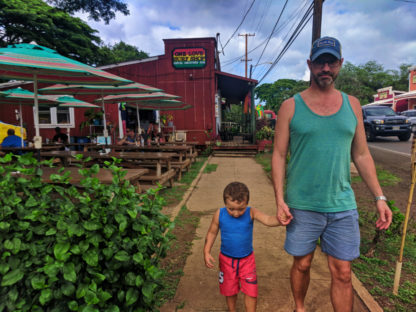 Our family trip to Hawaii wasn’t all about finding the best places to eat on Oahu, but we found pure Hawaiian gold for nearly every meal. 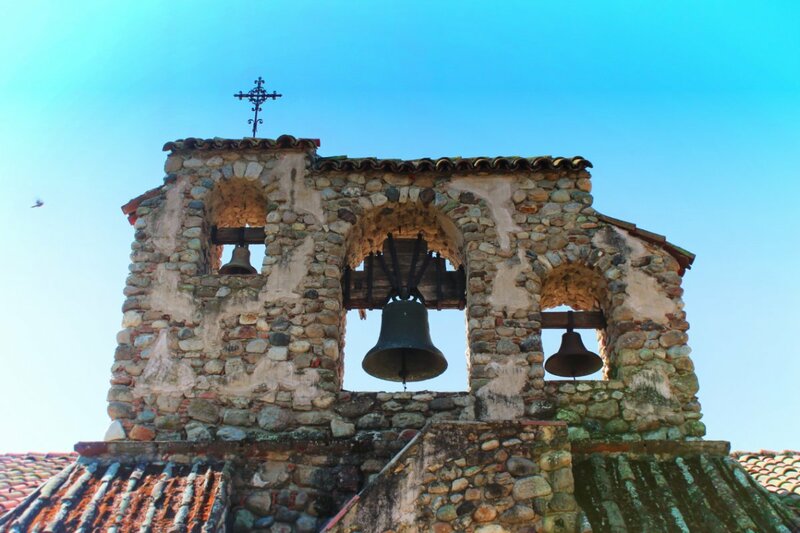 Take our tips and what we looked for and go seek out your own food discoveries. 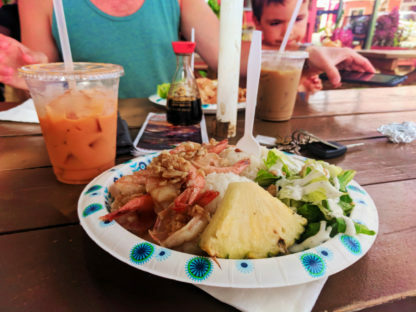 You can learn a lot about and fall in love with a culture from its food, and Hawaii is all about good food and welcoming you into their ohana. 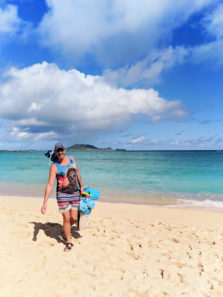 Want to pin this for you own Hawaiian adventure? Go for it!! !